The strongest of dragons is the All Father. 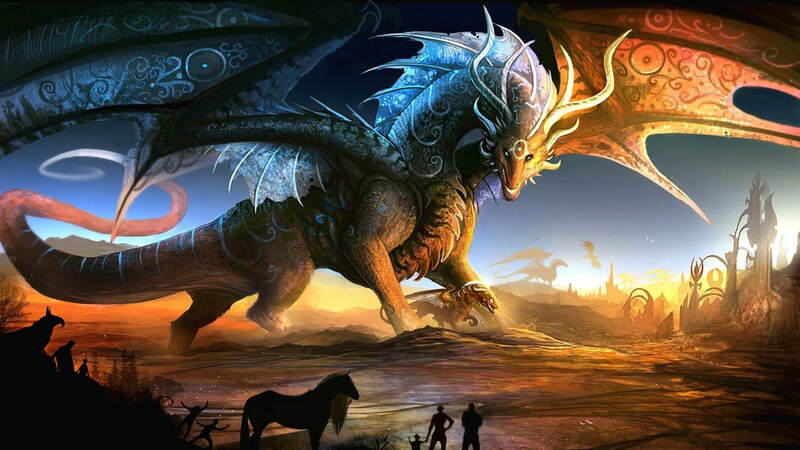 It is said that Pha Rann created the first dragon. This is not true. Many eldar had continually shifting forms. The All Father perfected the form of the dragon and was soon copied. The titanic size, the wings, the breathe weapon, taloned claws... it all spoke to the indomitable will of dragonkind. Yet, when Time moved, the All Father could not resist aging by will alone. He allied himself, and sought to align all dragonkind to Pha Rann so that the work of creation might continue. Tiamat, his consort, raged against this decision. Her words spoke to the hearts of all dragons when she proclaimed, "Creation bows to the dragon, not the other way around! Do not do this thing!" Though the All Father claims all dragonkind as his dominion, the truth is only gold and silver dragons amongst the eldar pledged to him. The fallen metallics did not. Most of the eldar pledged to Tiamat. To ensure the Gate of Creation would never fall, Pha Rann entrusted its stewardship to the All Father. While Pha Rann is the Nexus of Creation, he has a mighty bodyguard in the All Father. They view gold and silver dragons as caretakers of the mortal races and revere them, even the fallen ones, as avatars.